Happy 4th of July weekend to my friends here in the U.S. We're heading into a 3 day weekend, and I can't wait for the fireworks, food, and fun to start. We still haven't finalized our plans for the 4th, but one thing I do know- we'll be chowing down on good old American grub shortly. Independence Day and food just go hand in hand. I thought about making an apple pie, because nothing's more American than apple pie, right? But then I thought, cherries fit with the holiday theme too. After all, Washington did chop down that cherry tree. Thankfully, he didn't chop them all down, and there's an abundance of cherries at the grocers right now. The more I thought about it, the more I wanted to scrap the pie idea and make a large cherry dessert that would please a crowd. 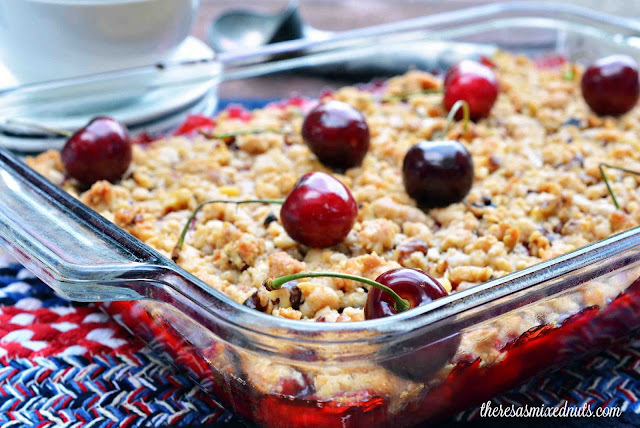 So, I scoured Golden Blossom Honey and hit the jackpot with this Cherry Crisp dessert. This old-fashioned cherry dessert is sweet, delicious, and perfect for a crowd. Served up warm with a scoop of vanilla ice cream, our Founding Fathers would have celebrated this dessert, I'm sure. American readers, have a happy and safe Independence Day. Everyone else, have a wonderful weekend! I'll see you back here on Tuesday. It's with oats? How very delightful! I bet the crispy crunch is nom nom especially with them walnuts as well. Haven't eaten cherries in God knows how long, they're here for maybe a week or so and are always expensive and unripe.... but I do love me sour cherries in pies and isn't it lovely when you grate the crumble on top? Oh man, that sounds AH-MAZING. You are a genius. I want some of this NOW. Happy 4th coming up! This does look good. I just make a crisp with blueberries and strawberries that was really good. I wanted to post the recipe, but that's when I lost my camera, which has since been found. That sounds so good! I love to sweeten dishes with honey. It adds sweetness with a slightly better glycemic index. I love cherries. This is the perfect 4th of July dish because the red color is so patriotic. I lvoe cherries, but I rarely buy them for some reason. This is a recipe I could really sink my teeth into! Cherries are so delicious! This looks like an amazing recipe to eat right up! 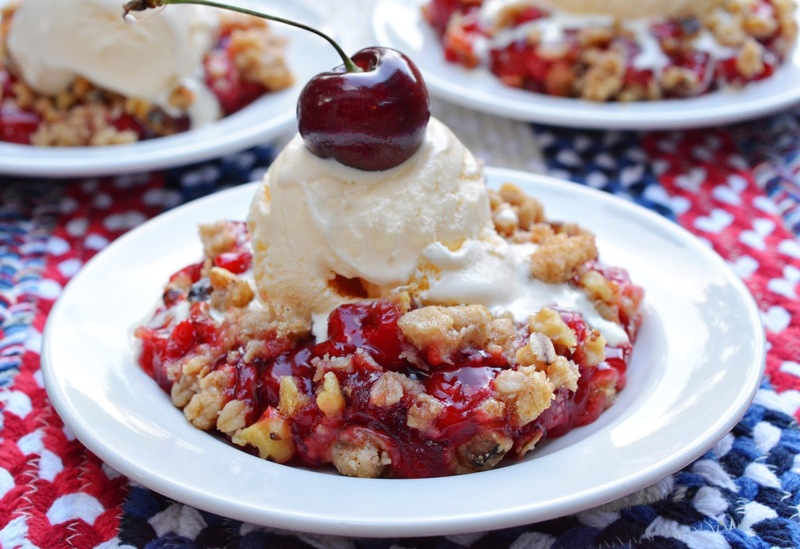 This cherry crisp looks phenomenal and ideal for the Fourth of July. I would warm mine up a bit and add a scoop of vanilla ice cream. 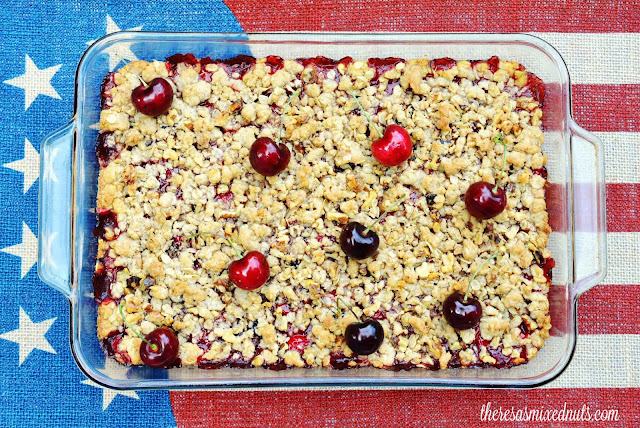 My middle child loves cherries, so this recipe may be something that I try over the summer. Thanks for sharing - it looks soooo yummy! This is such a great cherry recipe. I really need to pick some cherries up. I'm excited to bake with them. Wow, this recipe sounds delicious! I know I will enjoy it and I can't wait to add it to the family cookbook. What a gorgeous and delicious looking dessert! I'm a sucker for cherries! Oh, I love this! I like cherries so I am also making this for the weekends. My whole family loves cherries and this looks like the perfect thing to bring to a party. You always inspire me with your recipes! The perfect 4th of July treat! I have everything needed for this yummy-looking cherry crisp. Thanks for the nice way to celebrate the holiday. Oh yum - that looks amazing!! Will be trying this very soon!! 😊 Hope you have a Happy 4th! I love Americana desserts like this. They are so easy to make and soul-warming. That looks so tasty and cherries have lots of nutritional value in them you'll want to eat them whole! !